Relaxed yet sophisticated, this lamp table will bring timeless traditional elements and a contemporary feel into any living room. 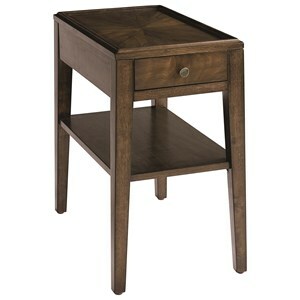 This table features beautiful walnut veneers with a sunburst effect on the table top complemented by a smoked gunmetal drawer knob. To help you achieve a clutter-free living room, you'll also find a drawer for remotes and other items you need close by while you relax in your living room. 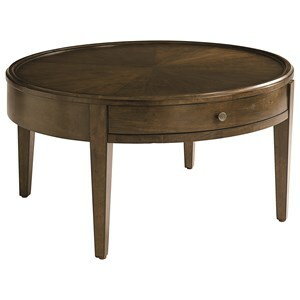 The Palisades Contemporary Round Lamp Table by Bassett at Wayside Furniture in the Akron, Cleveland, Canton, Medina, Youngstown, Ohio area. Product availability may vary. Contact us for the most current availability on this product. Browse other items in the Palisades collection from Wayside Furniture in the Akron, Cleveland, Canton, Medina, Youngstown, Ohio area.